Years ago, some friends of mine attended a summer school that had a pair of cordon bleu chefs on staff. One can imagine the meals! Rich, delicious, works of art really. Then, one morning, they walked into the cafeteria to see something new. Bowls. Spoons. Pitchers of milk. And lined up, in a neat row, boxes of the sugar-laden cereals of childhood. Fruit Loops! Frosted Flakes! Cocoa Puff! Captain Crunch! My friends squealed with joy. That sums up my reaction to a piece of cinematic schlock known as Renfield The Undead (2010). By no stretch of the imagination can anyone call this a good movie. The acting for the most part is slightly above the level of an average Ed Wood movie. Characters aren’t quite one-note, but few can manage an entire second. Special effects look like exactly that. The story–well, I’ll describe that in a moment. But this does qualify as fun. Lots of fun. If you’re in the right mood. In the fictional metropolis of Bayou City (presumably on the US gulf coast) a rampaging serial killer has the police baffled. Known as “The Butcher” he cuts each of his victim’s heads off. But, and here’s the detail that barely gets noticed, each victim first loses nearly all their blood. Sure enough, the Butcher turns out to be none other than Renfield, former slave of the late great Count Dracula. He’s got enemies–none other than a vampiric Mina and her half-blood son Quincey. 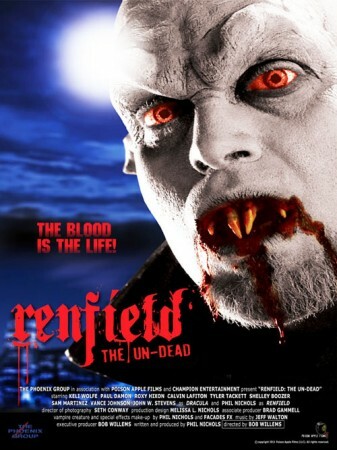 Seems Renfield has Dracula’s skull and they want it back to resurrect the Lord of the Vampires. Renfield, on the other hand, wants Dracula to stay dead. All this sounds like the most mundane direct-to-dvd sort of cheap bloodfest. It nearly is. But somehow it manages to be more. Much of this hinges on Phil Nichols, who portrays Renfield. Imagine if you will the Joker as a vampire–but more, the Joker as a vampire with something like a conscience. Nichols’ performance demonstrates why actors love to play villains and madmen, yet also why so many aren’t really that good at it. Bursts of maniacal laughter are all well and good, but nine times out of ten the one doing it doesn’t get the joke. They just laugh. At what? You can tell they don’t know. Not here. In this case, Nichols’ Renfield has a very specific joke in mind. One rather heart-wrenching. Which brings up the other major contribution Nichols brings to this film. The script. He and script doctor Molly Vernon took what should have been nothing but a piece of junk and added…what? Some style? Some pathos? A tiny bit of depth? Essentially, we get the back story when a coroner accidentally stumbles upon the fact some of her ‘clients’ aren’t really dead. Caught in fight over Dracula’s skull she ends up bitten and eventually starts experiencing Renfield’s history as he tells it. For the record, the folks who did this know their vampire stories, but handle all this with lighter touch than one might expect. Renfield was a solicitor, a man grieving for his late wife and eager to take care of a young daughter. When sent to Transylvania on business, he is bitten and enslaved, driven mad by his experiences. Within the insane asylum of Dr. Seward (rightly described as a “hell hole”), the man warns others of the vampire coming to England. They believe him too late for Lucy and (ultimately) Mina. Dracula appears before his slave, holding in his hand the doll that belonged to Renfield’s daughter. As the madman weeps in horror, Dracula says every kingdom needs its court jester. Soon Renfield is dead, but rises again. Much of what we see in this look ridiculous. A lot of the actors can barely make it out of a wet paper bag with these thespian skills. The less said about the hair pieces the better! Yet lovely little details abound. A hint that Lucy and Mina might have been lovers, for instance. The way the coroner almost kills herself as she feels the change taking hold. And the way Dracula even says “I love you” to Renfield while slaughtering him. Like I said–not good. Bad, in fact. But kinda gloriously bad. Wonderfully awful. Cheese but a nice sharp cheddar, not any of this processed mild velveeta stuff. Exactly right if you’re in the mood for top-notch schlock. Sorry to say, I don’t know the answer.